Christmas and many other holidays always inspire me to craft and create. This past Christmas my family and I went to see an Irish traditional folk band - "Cherish the Ladies". 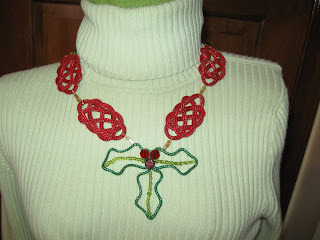 I wanted to go wearing something festive and celtic so I designed and knotted this necklace - Christmas Celtic Knot Necklace. I used metallic cording, glass beads and wire and wore it with a plain light green sweater (as seen in the photo) so my creation was "center stage".